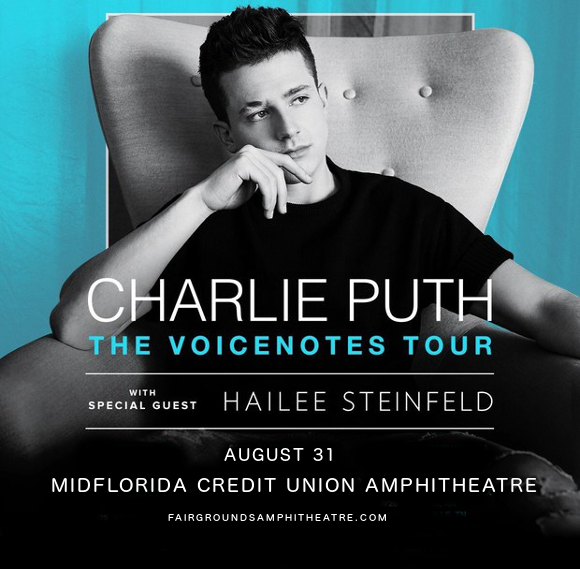 Calling everyone who loves Charlie Puth – the “How Long,” star is on tour with his upcoming brand new album “Voicenotes!” Also joining him on the huge North American jaunt is shining new star Hailee Steinfeld! On Friday 31st August 2018, they’re coming to give you the show of your life at the MidFlorida Credit Union Amphitheatre – don’t miss out! Tickets are bound to sell fast, so get yours early, while you can. As for Hailee Steinfeld, she started out as an actress, and with plenty talent still to spare, moved into singing after performing "Flashlight" in Pitch Perfect 2, releasing a cover of the song, and becoming signed to Republic Records. "Love Myself”, her debut single, was swiftly platinum certified, and “Haiz,” her first extended play, saw a positive critical response and widespread success across North America. Now, she’s teaming up with Charlie Puth to take her talents even further. Don’t miss your chance to see these two sensations of pop music – get your tickets to see Charlie Puth and Hailee Steinfeld TODAY while they last!